Interviewer: How old were you when your parents were murdered? Didi: It’s a very difficult feeling. To first of all see a flowering and thriving neighborhood. And our home, the home and neighborhood where our daughters were born. And since we got married, we have lived here. To think that this neighborhood is going to be destroyed, to be turned into a ruin. The truth is that as I’m fighting this battle to save Givat HaUlpana, I’m also organizing the 10 year memorial for my parents and brother. Didi’s wife remember’s Didi’s father z”l: Saba Yossi, that is what we would call him at home. He was a happy man. Alive. Didi: My Abba had a way of singing…Sometimes it was embarrassing for us. It wasn’t so fun for us, for example, to have to make a big dancing circle in the middle of the Western Wall Plaza [laughs]. And every Thursday, we had this tradition…We would wash the floors, all the children together. The problem is that in a 4-room apartment it’s impossible for everyone to move all at once. But we had 10 mops, and every single child would mop, and one would move the water this way, and the other would push the water in the opposite direction. In the end, we would all stand outside on the porch, and each of us would receive a popsicle, that was a part of the tradition, and my father would mop up after us. But that was our thing, we would do everything all together. After an hour, everyone was happy, and the house was clean. as though…yes, this is going to be your house too, and you are our partners. around with us to choose the marble counters for the kitchen, and to choose the kitchen itself, and everything. initiate and affect others and take responsibility. At the time of the murder, my brother Shuvel Tsion z”l was 9. Sweet and small, that’s how he’s remained in our memories. He was a child who had many close friends. He had a very developed imagination, he would tell fantastic stories to our younger siblings. It’s not a terrible thing that 30 families are going to be thrown out of their homes? And still, in my heart of hearts, I believed it wouldn’t happen…. Interviewer: Do you believe that they are really going to build you new homes if they destroy Givat HaUlpana? Didi: No. The “caravilot” (large caravans) that they promised us are exactly what they promised the evacuees from Gush Katif 7 years ago! 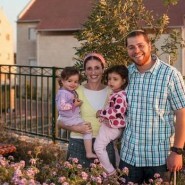 And the Gush Katif evacuees have never received their caravilot, or permanent housing. So we know what all these promises are worth. This neighborhood was built with the encouragement of the government, the government invested in the infrastructure here and even provided grants to all of the families who agreed to buy homes here 12 years ago. since our parents were murdered. My siblings spend many family Shabbats here. We made the Shabbat before my brother’s wedding here. We were happy that there was a big brother who could finally host everyone. I can not understand how a government of Jews can inflict such heartless damage on other Jews. I grieved over Gush Katif and could not get a grip on what happened in Amona. Who gains by this destruction? how does it accomplish peace? It is like a nightmare where we can’t wake up.